The kids have continued their study of Ancient Greece. One of the things that has been particularly interesting for Nicholas is the bronze weapons that were used. Civilizations we studies earlier this year used stone for sculpture, writing surfaces, and weapons. That was the Stone Age. Ancient Greece culture is in the Bronze Age for bronze was the most sophisticated material they had at the time. Bronze is a mixture of copper and tin. We studied a little about how copper ore. We watched several videos like this one on Lost Wax Casting but we had to watch several videos on bronze sword making as well. Last year we were visiting Vetro Glass Studio in Grapevine and discovered the Grapevine Foundry. 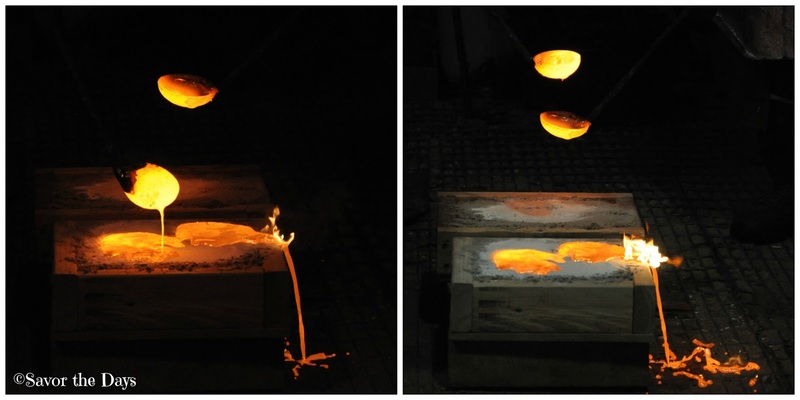 So we decided to take a field trip there with our co-op group to learn first hand about casting bronze. Linda is an incredible artist and she is very passionate about bronze. She talked to the kids about the process and showed them some pieces that they are working on. She showed us this clay bust of a woman. Her husband commissioned the piece to be made. Once the clay model is made, they cover it in wax and then plaster. The wax is melted away and then they can use the hollow space where the wax was as their mold for the liquid bronze. We got to see where all of the exciting work happens. Look at that green fire! The green glow is caused by the copper that is melting in a receptacle inside the fire. This fire is about 2000 degrees! The kids had a fun opportunity to make a keepsake while they were there. They had their handprints cast in bronze! They started with a box filled with tightly packed sand. The top was dusted with powder. They each pressed a hand print in the sand. Linda made sure that there were fingers overlapping so when the bronze was poured it would become one piece of art instead of two separate hand prints. I love that idea! This became the mold that the bronze would be poured into. For obvious reasons, we were not allowed in the work area but we could see everything from a safe distance away. I love this picture. They look like mad scientists at work. We saw this gentleman scoop some of the bronze out of the fire and dump it in this metal bucket. Ahh, he was removing some the of impurities off of the top of the molten bronze. We learned that from one of the videos we watched. Then he scooped some more bronze and started filling the molds. I don't know why my camera took these darker picture (maybe the flash went off?) but they look even cooler this way! Look at the bronze just pour onto the floor! It is so hot that it even caught the wooden mold on fire! After just a few minutes, you could see the bronze turning from red to brown as it began to cool off. Amazing! Linda took them out of the mold and quenched them in water. You may not be able to tell from this picture but she is holding them with a special tool because they are still super hot! Look how neat they turned out! Linda said she needed about 20 minutes to clean up the edges some so we left them with her and wandered down Main Street for a while. The kids found these fun bronze statues of kids and a dog at play! What a perfect way to wrap up our field trip! Bronze is such an incredible material and the works of art (or weapons as Nicholas would say) are just amazing. We headed back to the Foundry and picked up the hand prints. I just love how they turned out and I love that there is a print for each of them and they are joined in bronze. The Grapevine Foundry is located at 701 S. Main Street in Grapevine, TX. For more information and a list of classes available, check out the Grapevine Foundry website.